Camping Fontaines is a small yet spacious family friendly campsite that lies within the countryside on the outskirts of Canet-en-Roussillon. 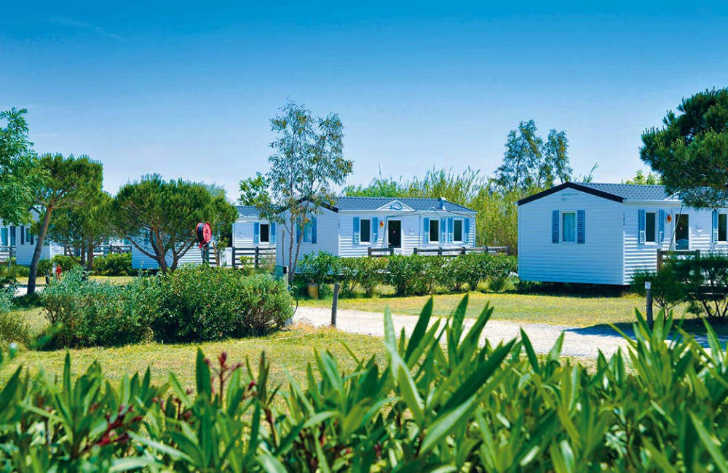 The campsite borders the Canet-Saint Nazaire nature reserve and lake which encompasses around 894 hectares. The nature reserve is home to over 200 different species of migratory and non migratory birds along with a variety of other animals and of course fish. The whole area is extremely popular with nature lovers and those wanting to get out and explore as there are miles of tracks suitable for walking and mountain biking. Right next door to the campsite and reserved exclusively for guests is a wonderful mini farm which is brilliant for younger children. Here you can spend a few hours petting and feed a variety of farmyard animals including sheep, goats, donkeys, ponies and pigs. The nearest beach to Camping Fontaines is approximately 4km away at the wonderful seaside resort of Canet-en-Roussillon. The beach there stretches out for in excess of 9km and is excellent for a variety of activities from a family day out at the beach, swimming, sunbathing along with more exciting water sports such as kayaking, paddle boarding, jet skiing and sailing are all available. During high season the campsite offers a shuttle bus to and from the beach to make your holiday that much more enjoyable. Swimming pool facilities at Camping Fontaines are basic but still very pleasantly presented. On site you’ll find a lovely outdoor heated family pool and also a children’s pool which are surrounded by a lovely patio sunbathing area. Camping Fontaines campsite offers a comprehensive selection of activities and facilities on site and also nearby to ensure you have a fantastic family holiday. On site activities at Camping Fontaines campsite include table tennis, multisports area, cycle trail, archery, football, basketball, volleyball, boules, mini farm, playground and cycle hire. Facilities available at Camping Fontaines campsite include WIFI, snack bar, bar, bread service, animation team, washers and dryers. Accommodation at Camping Fontaines campsite includes a range of 2 and 3 bedroom mobile homes that are available from Canvas Holidays .